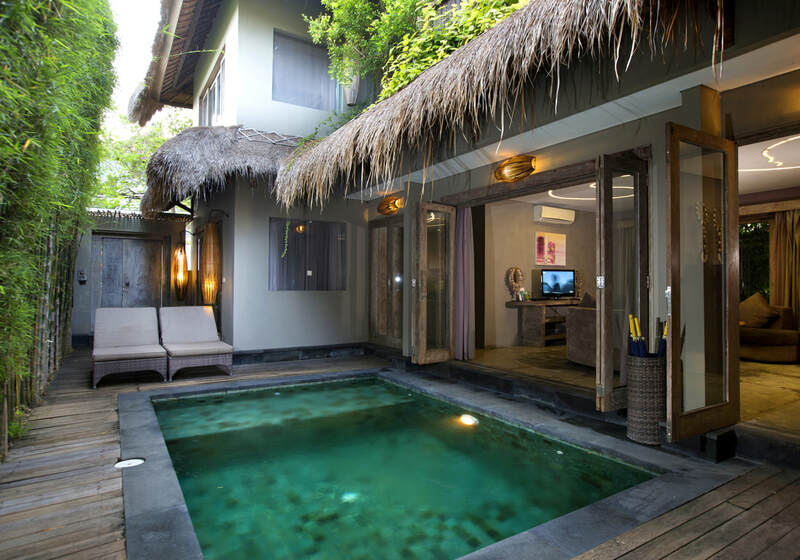 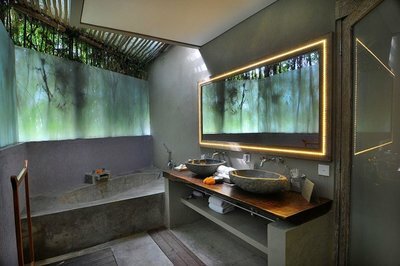 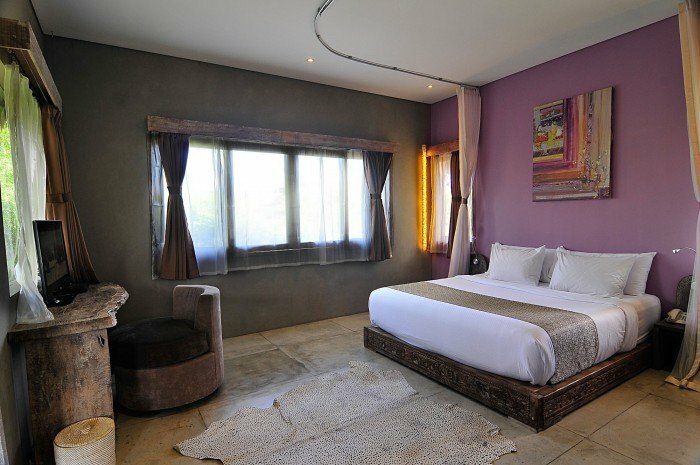 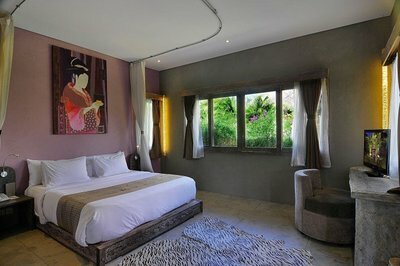 Blue Karma Hotel has 9 wonderful and luxurious villas from 1 to 4 rooms. Everybody, couples, friends and families, will find their happiness here. 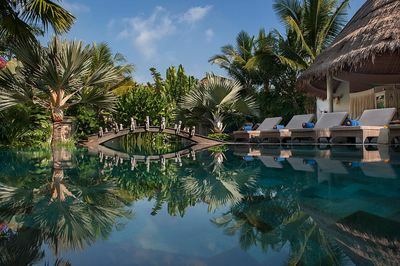 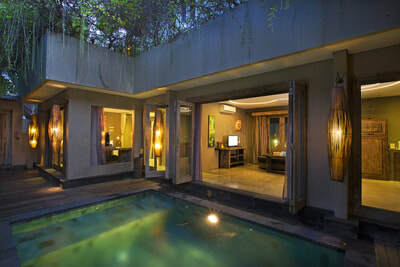 A tropical garden with pool, bar and restaurant add to your peaceful stay in Bali.Click here to get unbeatable price for this hotel. 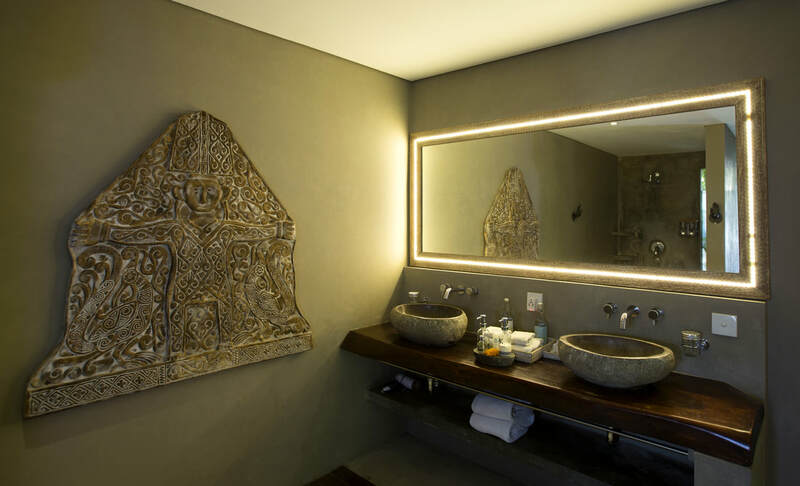 The site is mold by Alexa Aguila Genoyer’s artistic touch which you’ll discover right from the lobby through her colorful paintings in contrast with the sobriety of the chosen materials such as teak, lava stone. 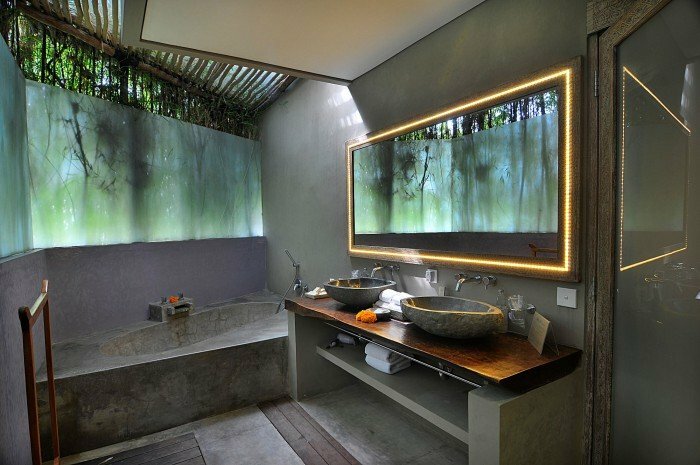 She has succeeded in creating a very special ambiance that makes modernity serve tradition, nestled into the abundant greenery. 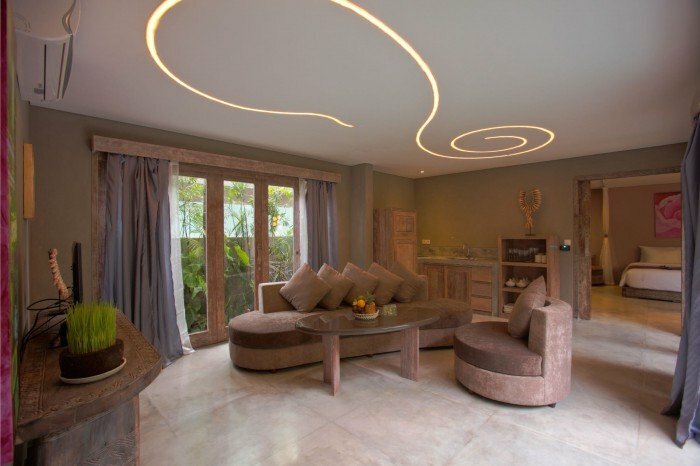 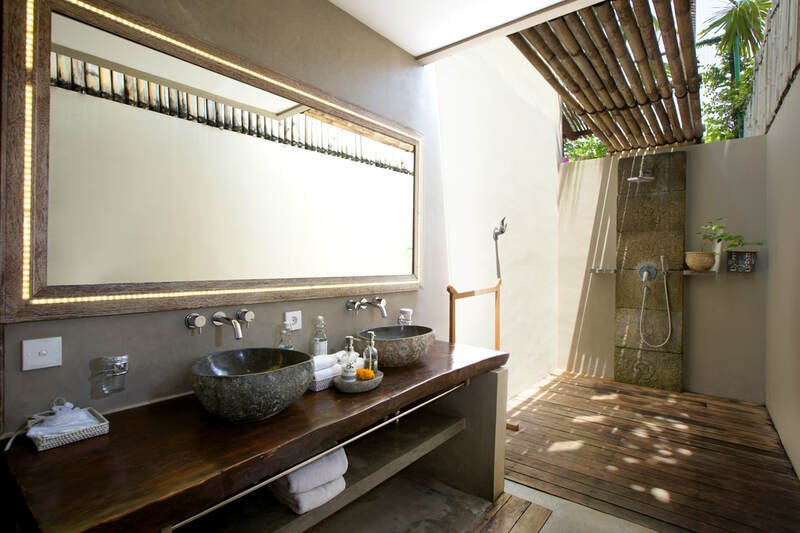 Sobriety and the refinement of the decoration lend to the site that special soothing touch, an invitation to relax body and soul in the spiritual heart of Bali. 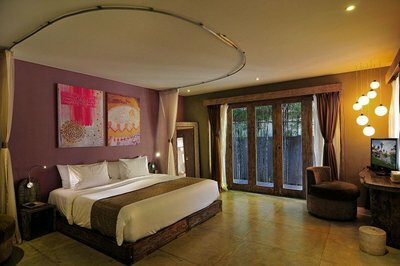 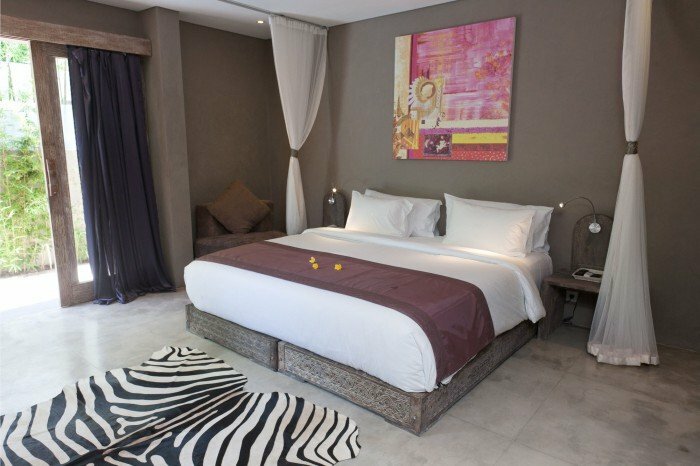 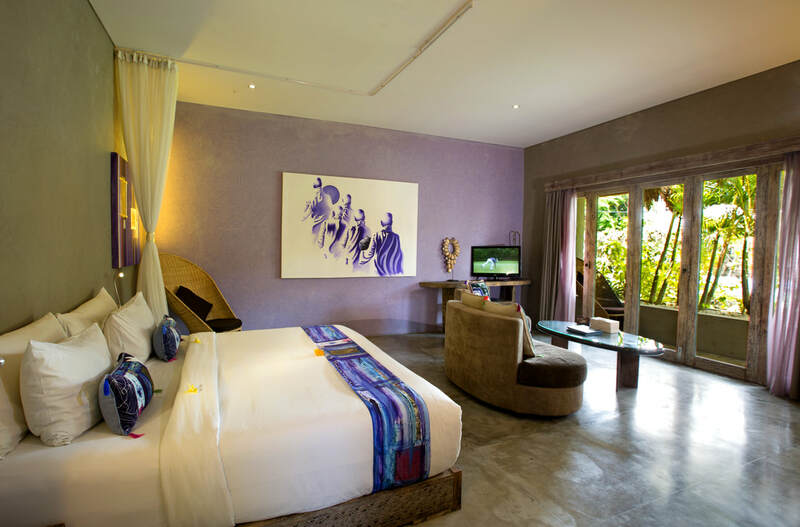 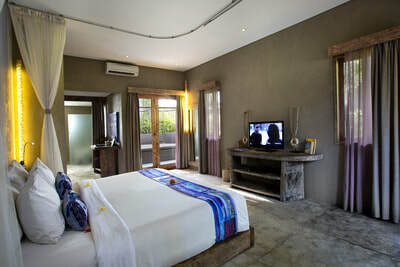 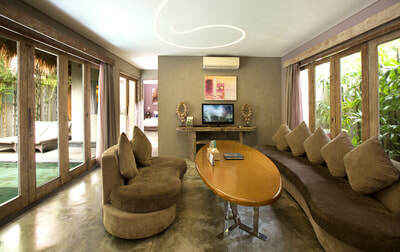 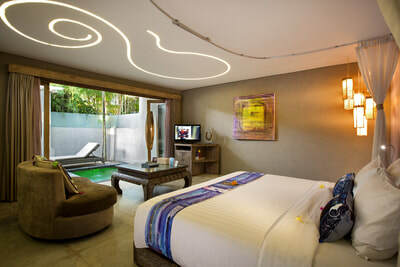 Enjoy your stay in Bali in this Suite with all the benefits of Blue Karma services. 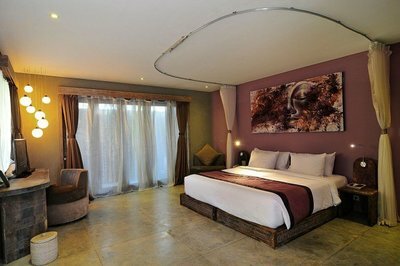 This luxurious suite includes a bedroom, a bathroom and a terrace, ideal for couples. 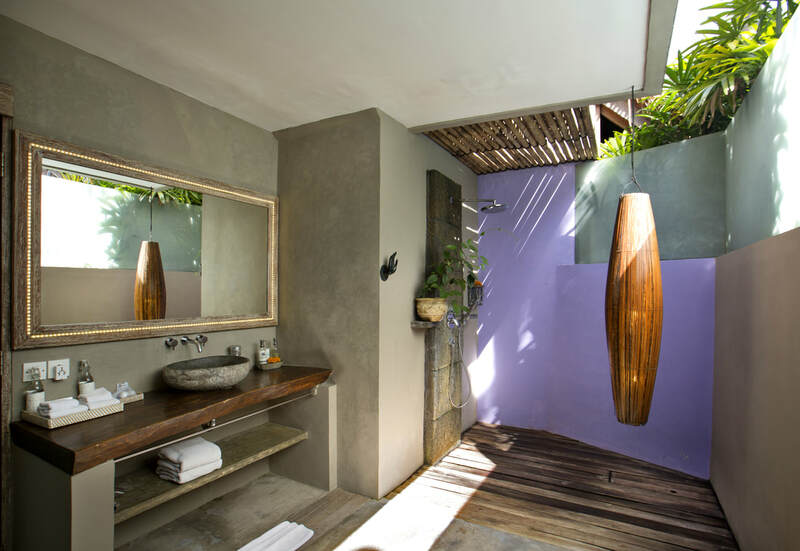 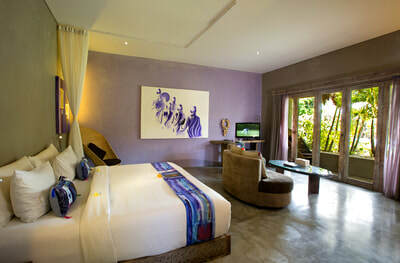 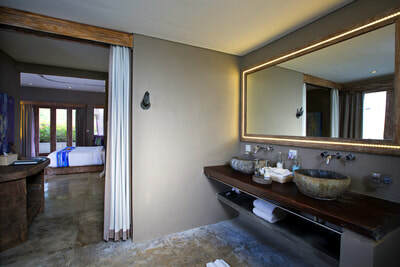 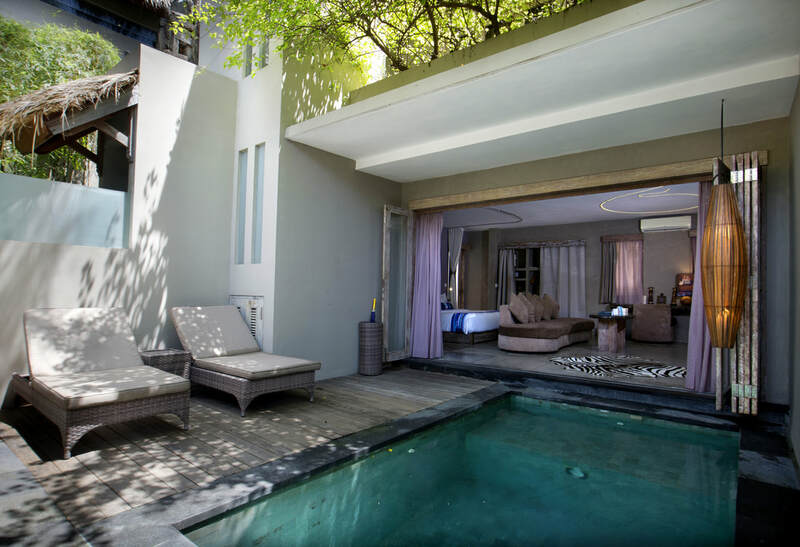 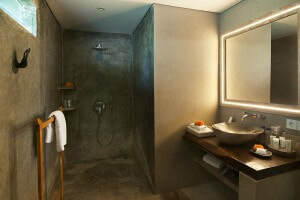 Enjoy this suite with its private pool as well as the main pool, bar and restaurant and spa Blue Karma Seminyak. 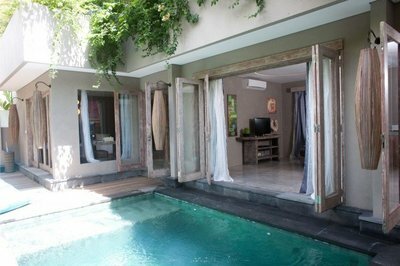 Take advantages of your family holidays in Bali in this 2 bedrooms Villa with pool and enjoy all the Blue Karma services ! A 2 bedrooms + 2 bathrooms villa with its private pool with a sofa, a terrace and a first floor balcony. 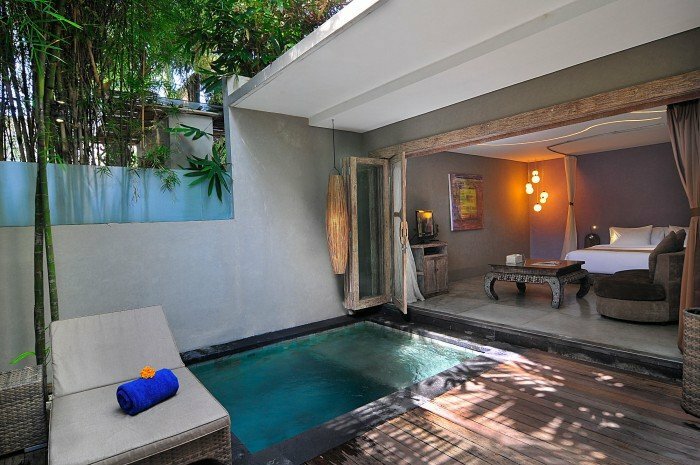 Enjoy the main swimming pool, bar and restaurant and the hotel’s spa Blue Karma Seminyak. 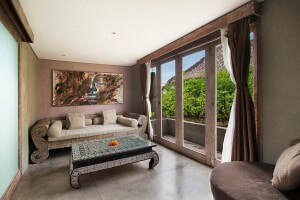 All the conditions are reunited to enjoy your holidays in Bali with friends or family ! Villa with pool, 24h room service and a delicious healthy restaurant ! A 3 bedrooms + 3 bathrooms villa with 2 balconies and a private pool. 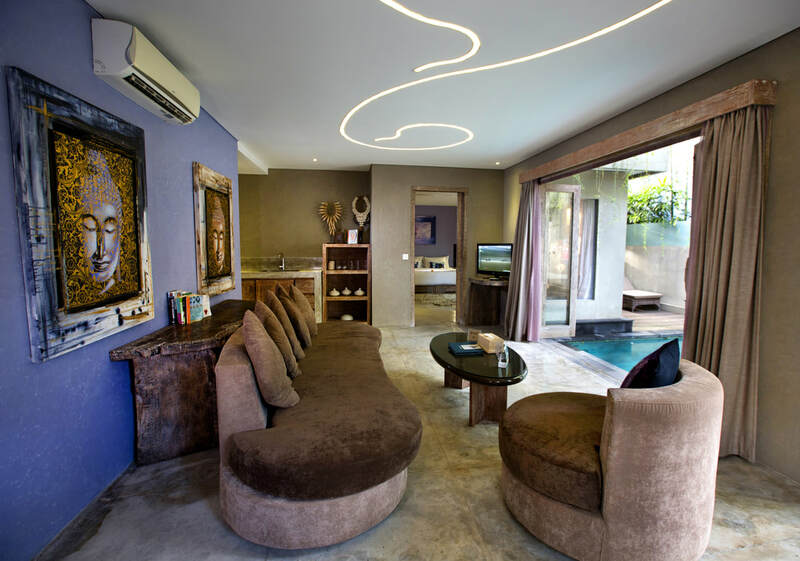 Enjoy the main swimming pool bar and restaurant and the Hotel’s Spa Blue Karma Seminyak. 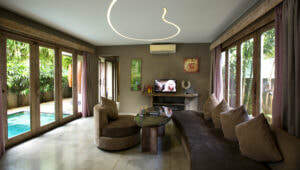 A 4 bedrooms + 4 bathrooms on 2 floors villa with 2 living rooms, a dining room, a kitchen and a private pool, ideal to share with friends or family. Enjoy the main swimming pool, bar and restaurant and the Hotel’s Spa Blue Karma Seminyak.